Large pasta shells filled with cheeses, shrimp and crab, baked in a creamed spinach sauce. Sauteed jumbo garlic shrimp add a touch of elegance. Cook pasta shells as directed on box. Drain and cool. Once shells have cooled fill shells with mixture. Place on a pan, cover and keep in refrigerator while you make the sauce. Melt butter in pan. Add onion and red pepper and saute until vegetables are beginning to soften but do not brown. Add garlic and continue to saute for one minute. In a jar shake together the cream, broth and flour until smooth. Add to sauteed mixture and bring to a light boil. Add spices. Mixture will thicken slightly but should still be fairly runny. Add a little milk if it's too thick, you want to be able to pour it. Simmer for 5 minutes. Pour half the sauce into a bowl and set aside. Add spinach to the pan with the remaining sauce. As spinach gets hot it will wilt down. This will take a minute or two. To assemble, pour the creamed spinach into the bottom of a low casserole dish. Place filled pasta shells right into the hot mixture, open side up. Pour remaining hot sauce over shells. Generously sprinkle with Parmesan cheese. Bake uncovered in 350º oven for 35-40 minutes or until bubbly and really hot. You want to make sure the filling in the shells gets really hot. 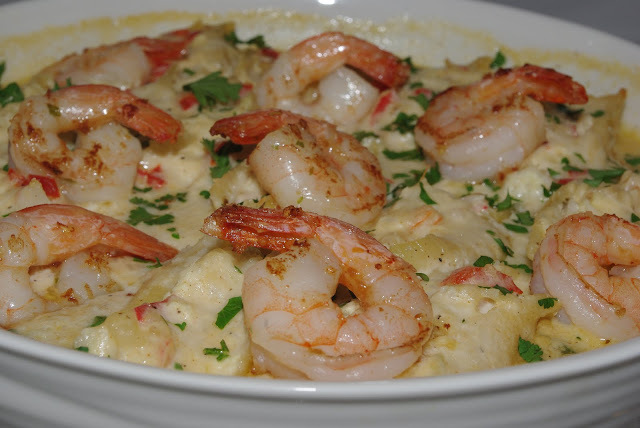 Remove from oven and top with prawns. In a large fry pan melt butter and add garlic and prawns. Cook over medium hot heat until prawns are cooked. They will cook in about 3-4 minutes. Top hot pasta dish with prawns and serve immediately. This sounds absolutely heavenly. However, I don't eat cooked spinach. Is there something else that can be substituted? You can totally just leave out the spinach. 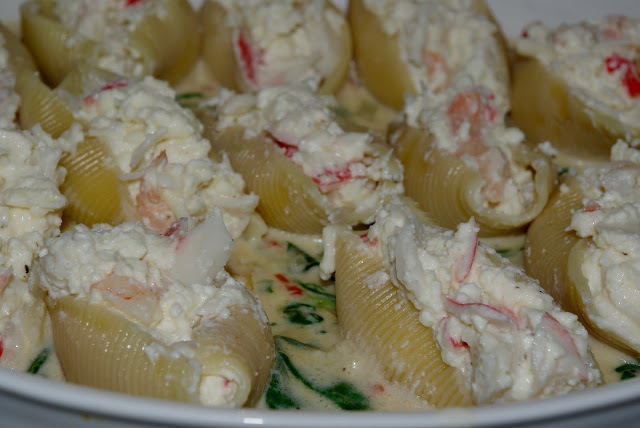 Pour half the cream sauce without spinach in the bottom of your dish, top with the stuffed pasta shells and pour the remaining sauce over. It will be delicious! Sorry to say I don't care for cooked green things. Prefer spinach and broccoli raw. May try it anyway. 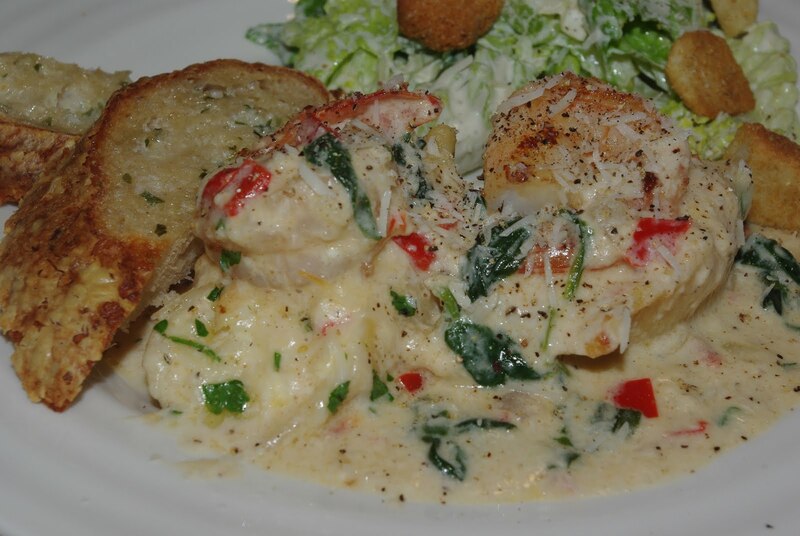 Seafood and cream sauce are a rare treat. Wow - that's a beautiful dish! It sounds absolutely scrumptious. OMG how mouth-watering....must try it. Do you have a take out order menu?